Plant or transplant in April–June when the danger of frost has past and soil has warmed. Direct-seeded beans will rot if the soil is too cold. Harvest window: 50–100 days depending on variety. Nitrogen fertilizer is not needed because beans are legumes that can fix nitrogen from the air. For a continuous harvest of bush beans, plant successive crops 2 to 3 weeks apart. 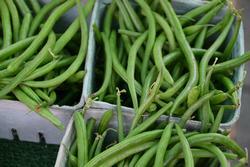 Pole beans bear over a longer period than bush beans but require trellising.